TeenLine Ireland have announced that the free, national listening service for teenagers has received approximately 25,000 calls and almost 26,000 texts since January last year. The service receives between 140 – 170 calls and texts a night while an extra 1,100 calls and texts were received over Christmas. This is a significant increase on the numbers of teenagers contacting the service since 2015. 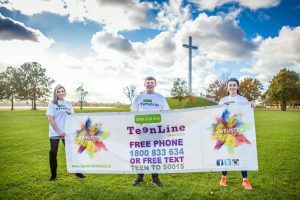 “The number of calls and texts are continuously increasing which highlights the demand for the unique service TeenLine provides to teenagers and young adults across Ireland. It is hugely positive to see so many young people taking the first step with TeenLine to reach out and talk about their problems,” said Declan Brennan, Chairperson of TeenLine. “We’ve visited over 100 schools this year across Ireland to talk with students about the service TeenLine provides and their mental health and we’re hugely appreciative to the schools who invited us to visit their students.. We have also enjoyed collaborations with other fantastic organisations such as Cycle Against Suicide, the Office of Children’s Ombudsman, the USI and the Irish Second Level Students Union, who are also spreading the message that it’s always ok to ask for help. We also collaborate with ChildVision Ireland and the Universities Association of Ireland, we’re seeing teenagers reaching out to us because of these connections”. Registered psychologist and Clinical Director of TeenLine Ireland Niamh Hannan said, “We have a large volume of calls and texts every night to the helpline from teenagers seeking support and a safe space to talk. Teenagers from all walks of life are feeling life’s pressures and are experiencing high levels of anxiety, low mood or depression with issues such as relationships, school, family finance, homelessness, sexuality and abuse. Our volunteers are trained to listen to teenagers and help them consider their options, We are a confidential, non-directive and non-judgemental service where the young person is always in control of the call or text. TeenLine Ireland recently hosted the first Purple Walk for Youth Mental Health and to raise vital funds for the service in Phoenix Park on December 27th. The event was well attended and TeenLine would like to encourage people to organise a Purple Walk in their own community or school to highlight Youth Mental Health. TeenLine in conjunction with Childvision are also organising The Rise Above Kayak Challenge on the Shannon from Lough Allen in Leitrim to Limerick for 4 days May 11th to May 14th to raise awareness of the challenges young people with disabilities or who are struggling with their mental health have to face every day. If you would like to volunteer with TeenLine please contactvolunteer@teenline.ie for more details about how you can help.